1st: Edit your text in the following field. 2nd: Click a button of "Go to Hand-Tracing". 3rd: Hand-tracing on your smart phone. 4th: After tracing, click a button of "Next". 5th: Repeat above 3rd to 4th. 1st: Click above and edit your English name. 2nd: Click a button of "go to Hand-Tracing", then your English name is automatically translated to Japanese katakana. For an example, "私はJohnです。" to "私はジョンです。". 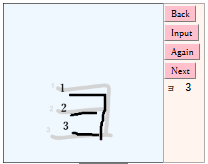 3rd: Click again a button of "go to Hand-Tracing" for tracing in the order. You can write your English name in Japanese on your smart phone. If your English name is not correctly translated, please send us your name. Please latest browsers such as IE11, Safari6, Chrome27, Firefox21, or Opera12 for HTML5. After hand-tracing, click a "Next" button. 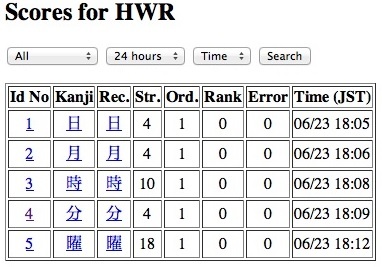 You can also use free Japanese fonts with stroke order numbers. Please download from "Kanji stroke order font" and install. Please access "Permit and Inhibit Directions in Kanji Basic Strokes". 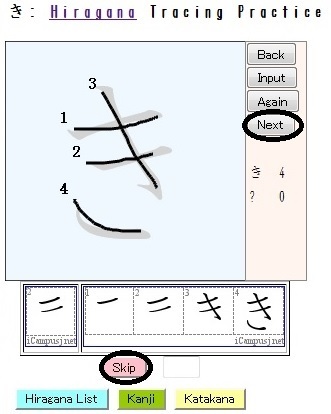 Student's wrinting characters are automatically judged by a system of Kanji hand-writing recoginition so that the system is useful for autonomous kanji learning. 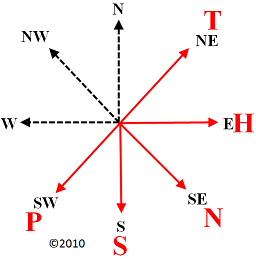 In a case of small characters such as "ャュョッゃゅょっ", please trace lower half part in drawing area. Please directly link to this page by the following style on your class web pages. Your students can get hand-tracing scores after login. 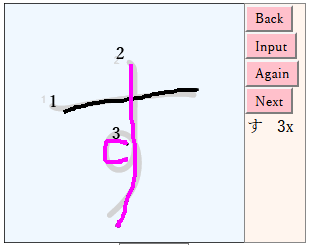 An example of hand-tracing scores. You can use free Japanese educational fonts for personal. Please access for details. For single letter tracing, please click letter-links in above list after reloading this page. If you have any question, please mail to us.